As professional chefs we begin with safety first! This entertaining and educational book provides hours of fun. 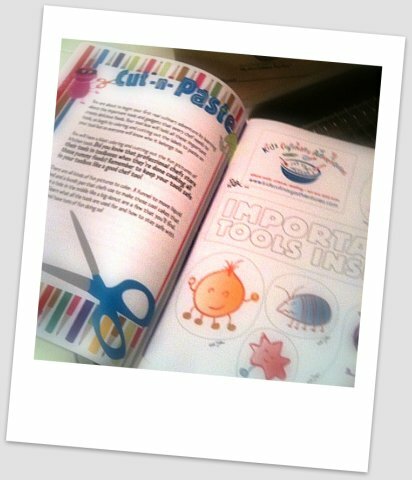 Small children will safely identify kitchen tools through a color, cut and paste activity which is a great introduction to everyday kitchen utensils. 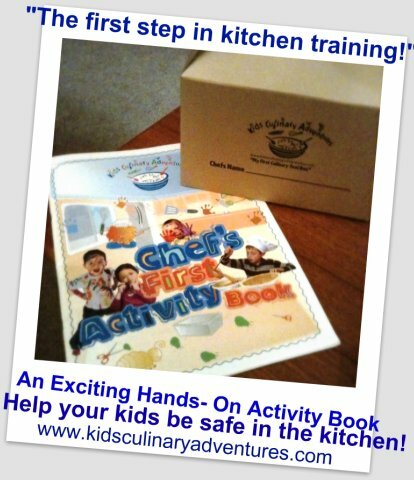 This fun engaging book comes with a small recyclable card board “toolbox” to carry their culinary items. Just like a real chef . This activity will also teach small children about items that could be hazardous if handled without the proper introduction! At Kids Culinary Adventures we think it all sounds as if everyone needs to just get back around the kitchen table! This year designate a day each week to prepare a meal together! And allow the kids to be a part of the journey. When you’re in the kitchen with your child, how often do you find yourself pouring the flour, dumping the spice, washing the bowl… and before you know it, the child has just had a chance to watch, or stir! Of course, it is only natural for us as parents to drive these skill sets, as they were driven for us. Successful parenting time in the kitchen will be a rewarding experience for your whole family. Below are lists of items that can help you get started ; please remember… as adults we view the world differently. In the kitchen we all will have to address a child’s natural interest in the variety of shiny small wares we have in the drawer. Because we use peelers, mashers, and cutters in our home kitchens on a regular basis, children will naturally be curious about them; parents and caregivers look at that overstuffed utensil drawer as something that fulfills a purely functional purpose. But what does a child see? Well… now that’s different! Through the eyes of a child that over stuffed drawer looks like a toy box full of fun gadgets, and this can be dangerous, and while successful parenting in the kitchen implies us to allow a child to do for themselves; it doesn’t mean to leave them unattended with hot or sharp kitchen materials! Also, when making your determinations, keep in mind every child is different. You should make the decision based on the child’s ability to focus, their desire to learn, and their dexterity. A child should always be supervised in the kitchen but allow them to take the task, unless you see danger ahead! Children under 7 years old should be given tasks of measuring, additions of ingredients stirring kneading or mixing ingredients by hand, shaping dough, spreading, mashing, shredding or tearing herbs and lettuces. Shucking peas and legumes; shopping, test tasting, and cleanup. Children 7 to 9 can handle peeling tasks. Guide a small hand with your own hand at first. The more often they hear, “Always peel away from your hands, not toward them,” the better. Have them peel over a paper towel for easy clean up. Children 11 and older are usually ready to begin using a paring knife. While peeling vegetables with length like carrots help keep their hands and the peeler further and further apart from one another. Start this age group put with vegetables that offer a little less resistance, and are easier to cut, such as zucchini and peeled cucumbers. Kids 13 and older can use larger knives and tackle more challenging cutting jobs. Even though these kids show more dexterity keep an eye on them. Usually this age breeds confidence which will lead to increased speed…increased speed which can lead to cuts. A gentle reminder to slow down is often the best way to keep someone on the right road. Make sure all your knives are sharp. If by chance, (and let’s hope not) someone does get cut a cut from a sharp knife the cut be as bad as one from a dull knife. Keep your cutting board on top of a damp towel to prevent it from moving and always work clean, it’s safer. To understand organic seems to be four years of college ! I’ll try to define it – (in short order) the best I can without turning green !